This super absorbent solidifies body fluids and water based liquids. Super Absorbent Aqueous Polymer absorbs 300 times its own weight. Solidifies liquids for transportation to disposal site. Absorbs any water based liquid. Absorbs and solidifies body fluids such as blood, urine and vomit. 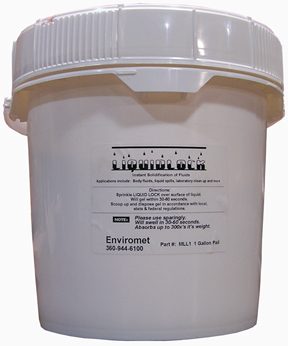 Ideal for lab applications to absorb chemical spills that release vapors.